Wow – I love this. What is the story behind it? We used to have the “Riderless Bicycle” on the AIDS Ride to symbolize our lost friends. It was amazingly powerful. I think it looks great! Do lots of your fellow bicyclists know about the term “Ghost Bike”? 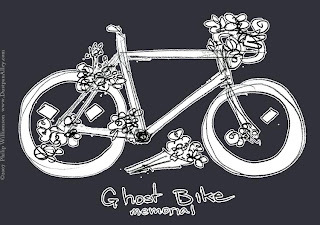 The couple of ghost bikes I’ve seen were really affecting, and then I think it was a picture of one that was the direct impetus for the drawing. I wanted to make one that was all clean and spiffy, but I thought it would lose something. These might get produced by the ‘rideyourbike’ tee shirt guy, with the proceeds going to the Ghost Bike Fund. That would be cool. Next Next post: Optimum Tire Pressure – 35mm tires.